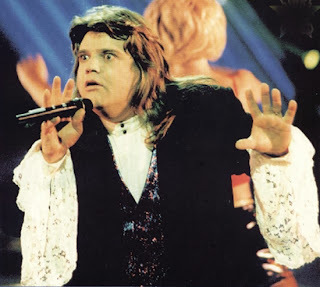 In 1977, an unknown American singer called Meat Loaf (image credit) stunned the pop/rock scene. His debut album Bat out of hell has been described quite aptly as a fascinating cocktail of Springsteen, Spector and Wagner. The title track is not as famous as the three hit singles (Paradise by the dashboardlight, Two out of three ain't bad and You took the words right out of my mouth), but in my opinion it is the best track on a CD that I consider one of the ten best CDs of all time. Almost 10 minutes of raw power with the piano solos and guest star Todd Rundgren's motorbike-guitar as fascinating instrumental highlights, ending in the death of the singer ("and the last thing I see is my heart still beating, breaking out of my body and flying away.... like a bat out of hell!"). Other songs by this act that would have qualified: Heaven can wait.